Pense que iba a haber fiesta, the third feature film of Victoria Galardi as director and writer, will compete in Seccion Horizontes Latinos in the 2013 San Sebastian Festival. Victoria, who also participated in the event with her previous two films (Amorosa Soledad and Cerro Bayo), will turn up in Donosti to present the public and media her new work, starring Elena Anaya and Valeria Bertuccelli. Produced by Fernando Trueba PC, Gale Cine and Magma Cine, has the support of INCAA and ICAA and with the participation of TVE. “It’s a dramatic comedy. As in my previous two films attempt to tell a drama that has a touch of comedy, where the main focus is put on the characters. In these two friends, those two women, different and equal at the same time, complex, competitive, lovable, insecure,” said Galardi. “My search I think it’s always the same. Love or lack of it. I’m interested in stories where you can see some of the stupidity, jealousy, weaknesses, the complexity of human beings … how selfish we can be when making decisions and how self-love often is interposed ahead of love,” concluded the producer. 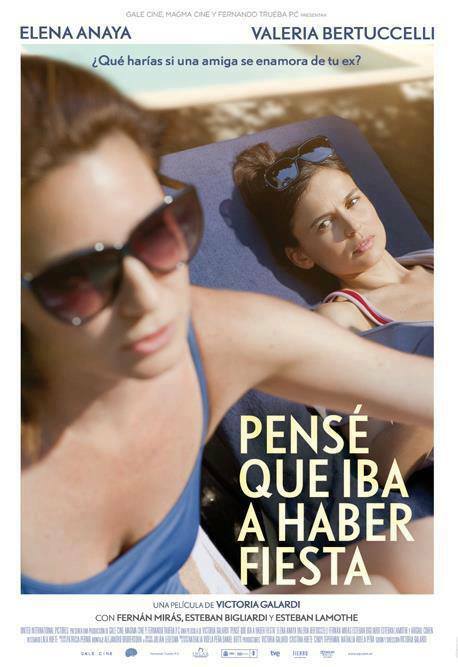 Pense que iba a haber una fiesta, is a dramatic comedy in which Ana (Elena Anaya) begins a passionate affair with the ex-husband of her close friend Lucia (Valeria Bertuccelli) while taking care of her house and her daughter during a vacation. This entry was posted in MOVIES, TELENOVELAS/SERIES by TVMAS. Bookmark the permalink.